Brexiteer, n.: A person who supports Great Britain leaving the European Union. B. are easily distinguishable as their language involves the frequent use of subjunctives (example: “If Britain leaves the EU we could…”) and racist language (example: “Immigrants are ruining the NHS”). B. are also characterised by little knowledge or deliberate self-denial of knowledge about the European Union. They tend to be white, preferably male and their favourite pastime is to dream about the British Empire resurrected. Remainer, n.: A person who supports Great Britain staying in the European Union. R. are usually reacting to statements and comments by Brexiters instead of proactively praising the advantages and benefits of staying within the EU. R. tend to focus on very few issues (economy, economy, economy) thereby missing important issues such as the environment for example. They tend to be young, cosmopolitan or prime minister. 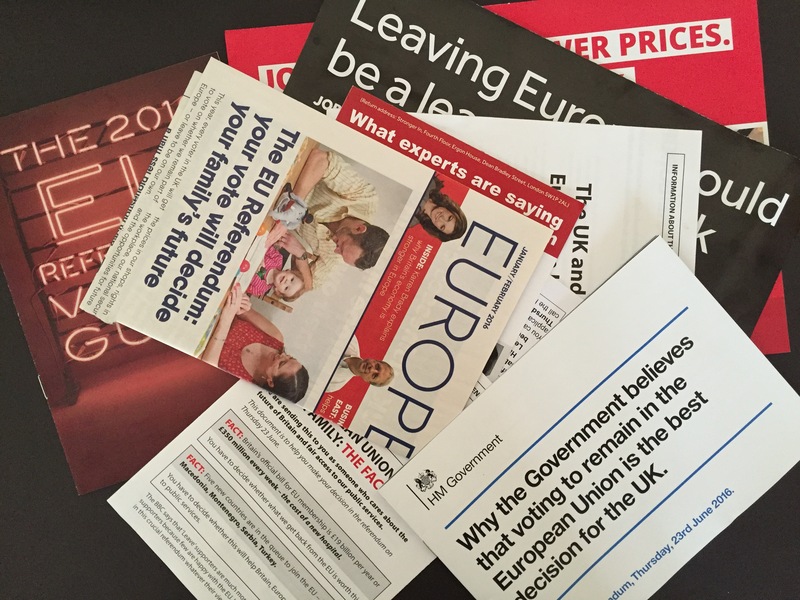 Referenda as opposed to general elections are usually a one-off thing. While a general election allows me to vote for or against a government at regular time intervals, a referendum usually concerns one issue and once decided it is hard to call for one again on the exact same issue – therefore Brexit is not just for Christmas. This is what makes Britain’s referendum on staying or leaving the European Union (EU) on 23rd June 2016 so interesting. Yet, the debate ahead of the referendum is characterised by distorted facts, hate, racism, ignorance and missed opportunities – on both sides. Mind you, this is not an attempt to rectify facts or debunk myths. This would take too long, others have tried it and it seems a hopeless task given the aforementioned ignorance in the debate. On the other hand facts are desperately needed. As a social scientist who was trained as a political scientist it personally hurts me how many lies are spread about the EU. I do not expect everyone to exactly understand how a qualified majority vote works or what the open method of coordination is, however a basic understanding of the core EU institutions and processes would do anyone good, especially for those campaigning for leaving the EU. It gets farcical when UKIP leader Nigel Farage, a democratically elected member of the European Parliament, rants about how undemocratic the EU is. It amazes me how one of the prominent figures of the Vote Leave campaign, London’s ex-mayor Boris Johnson, is in self-denial about the EU. Johnson spent several years of his life in Brussels as a news correspondent yet he seems to have forgotten the basics of the EU. Johnson is pursuing his own agenda – becoming Britain’s next prime minister – on the back of the EU referendum no matter what it takes. When he disembarked from a Vote Leave campaign bus in Cornwall he raised his arm proudly up into the sky with a Cornish pasty in his hand in an attempt to fraternise with the locals. However, Cornish pasty is protected under the EU food name scheme saving it from false copies, therefore locals clearly profited from Britain’s EU membership. The EU or “Brussels” is Britain’s favourite scapegoat. Anything that goes wrong, it must be the fault of Brussels. However, the housing crisis, the NHS, stagnating salaries, etc. are home-grown problems and not the fault of the EU. Let us assume Britain votes to leave the EU. Weeks and months later people will realise that the problems they associated with “Brussels” are still there and not the fault of an allegedly undemocratic dictatorship of the EU. Which brings us back to knowledge or rather the (deliberately) non-existing knowledge about the EU. Vote Leave’s catch phrase is “to take back control”. I wonder what they mean by that. Let us be clear, holding a referendum on EU membership is an utmost expression of national sovereignty. If the EU really were a dictatorship, as Leave campaigners propose, a referendum would not even be possible. What Vote Leave also fails to admit is that EU legislation often comes in the form of framework directives. As the name suggests it is a framework, which has to be adapted into national law. This gives every EU member the chance to adapt a directive according the country’s governmental system. And let us not forget major decisions in Brussel are taken by the Council, a body that is made up of either the prime ministers or portfolio ministers from every member country depending on the policy field. Therefore it is not any Brussels bureaucrat but essentially an elected MP who makes the decision. And as in the House of Commons you can lose decisions or win decisions, and that is called democracy. In my view the hidden agenda behind “take back control” is to get rid of Brussels by means of accountability. Curtailing worker’s rights, liberalizing the economy further will be so much easier without the EU and many who fall for the rhetoric will wake up in awe. The Remain campaign is in a dilemma though precisely because of the aforementioned. For years representatives of the Remain campaign used Brussels as a scapegoat for unpopular decisions. Suddenly they have to defend and praise the system. That may be one of the reasons why they are so haphazard in their campaign. Let us be clear, the EU is not perfect and there is a lot that could be changed to the better. We could give more power to the parliament; let the parliament vote for the Commission; revise agricultural subsidies etc. Nonetheless, the EU has done great things in the past decades. Peace, free movement of goods and people or protection of the environment. Especially the latter is worth mentioning and I (and others: The leave campaign doesn’t want to talk about the environment. Here’s why by Craig Bennett) cannot understand why this is not emphasised more by the Remain campaign. Environmental problems such as air or water pollution do not stop at country borders. When Britain entered the European Economic Community (EEC), as it was called in 1973, Britain was labelled the “dirty man of Europe”. At first they struggled with European environmental policy as it was dominated by German command and control regulation. Decades later Britain is a frontrunner, i.e. Britain is not usurped by laws they have no control over, as Vote Leave states, but it is actually leading by example. The freedom of access to environmental information is just one example that rested on British initiative and expertise. Or take EU funds for interregional projects that foster the collaboration not only between science, businesses and the public but also between EU countries. Britain’s southeast can therefore collaborate with regions in France, Belgium and the Netherlands. And isn’t that what Europe is about? Collaborating, finding solutions across cultures and countries. We should embrace this opportunity instead of condemning it. And if we find flaws in the system there are ample ways to change them democratically. Playing the blame game on Brussels isn’t helping anyone. But forget sovereignty issues, even forget economic issues. If you can blame immigrants that is even better than blaming Brussels. Unfortunately immigration has become the central theme of the referendum debate as much as it has become the theme of right wing and populist parties and movements across Europe or the United States. Mind you though compared to Geert Wilders, Germany’s AfD party, Victor Orban or Marine Le Pen, Nigel Farage’s UKIP party is a petty club for xenophobic ex-conservatives and millionaires. I can understand that people are unsatisfied with the current system, I am too, yet never would I dream of blaming immigrants for that. But instead of protesting at Westminster or the headquarters of companies that introduced zero hour contracts people kick their feet at migrants. It is easy, convenient but it is racist. A country that spent centuries colonizing major parts of the world now wants to close its doors and wants to have a go at nationalism. We had that before and we all know where it ended. Instead of celebrating the attractiveness of the country and deliberating how to cope with migrants, Britain and other countries want to shut their doors or build walls. Swiss law professor Martino Mona recently said in a newspaper interview that “migration is the last bastion of injustice” (“Wir müssen viel härter werden” (interview in German)). We have free movement of goods, free movement of capital, we can communicate with anyone on this planet in an instance, yet some us cannot get their heads around the idea that free movement of people is a logical consequence of that. Vote Leave’s argument gets even worse. 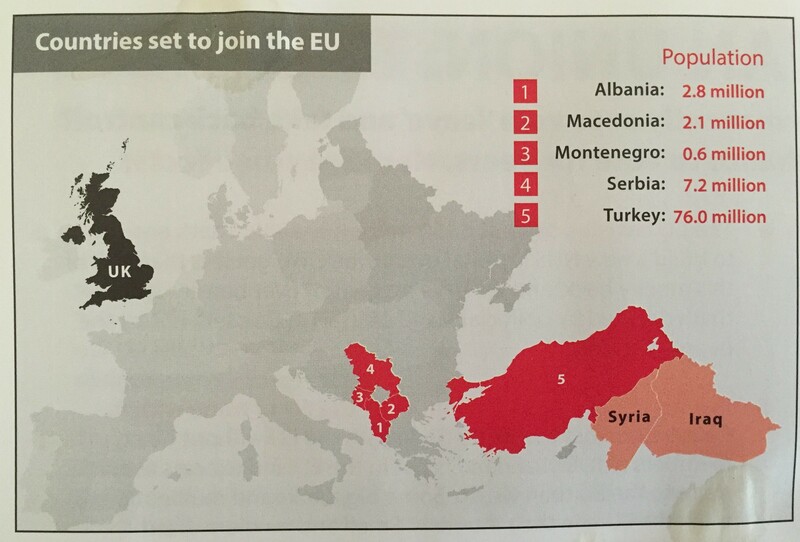 In the leaflets they distributed to households you find a map of Europe with countries coloured in red that are aspiring EU membership – among them Serbia, Albania or Turkey. In a lighter shade are Syria and Iraq. Is this supposed to tell us: ”If Turkey becomes an EU member country the way is free for Syrians and Iraqis and this is where all Muslim terrorists come from”. That is not xenophobic, that’s just racist. Full stop! British people tend to forget they are living on an island. It’s not actually easy to get here since the UK does not take part in the Schengen agreement. I know the argument is about EU migrants but again there is a classification. It is not about Germans, French or the Dutch, it is about Romanians, Bulgarians or Polish people. Allegedly they come here to scrounge off the social security system. Has it occurred to any Vote Leave campaigner that they come here to work because it is an attractive country and once they work that they pay taxes? If I want to milk the social security system there are countries in the EU that pay way more per week than the UK. Yes, there may be some rotten apples in the basket but not every Brit is perfect either. A comedian hit the nail on the head in a TV panel show recently. He said that there may be more beds in hospitals if we have fewer EU migrants but there will be no one to treat you because the doctors and nurses from EU countries had to leave, too. One of the greatest misconceptions is that people who vote for Leave think that things will change starting on 24th June 2016. This is a referendum not a general election. Boris Johnson, Michael Gove and Nigel Farage will not be in charge unless David Cameron steps down. Therefore all the promises they make are dependent on a variety of factors. For example in the beginning Vote Leave wanted to spend the £350 million Britain allegedly pays per week to the EU into the NHS. These days it is rather they “could be spent on the NHS or other things”. That’s a subtle but important difference. And if Leave campaigners such as Michael Gove want to put the £350 million into the NHS then only to make it more valuable for private investors in order to sell it. If Britain decides to remain in the EU it will unfortunately be the end of any reform discussion within the EU. Cameron will be more than glad to have it off his back and EU officials will interpret the decision to remain as a positive sign towards the EU. The worst people can do, and I fear many will do, is to vote for Leave “just because”. “Let’s give Cameron a slap in the face.” They should have done so in May last year at the general election. The referendum has an element of generational conflict as well. Young voters tend towards Remain, older people tend towards Leave. The latter want to see Britain “great” again, whatever that means, while young Brits embrace the benefits of being part of the EU. I can only appeal to older people: You have already played your part in the current housing crises and ruining our pensions, please do not ruin another part of our generation’s future. Tags: Bremain, Brexit, Democracy, EU referendum, European Union, Great Britain, Immigration, Racism, Referendum, Remain, Stronger In, United Kingdom, Vote Leave. Bookmark the permalink.